Joins in with hostile reception for former Toffees player. 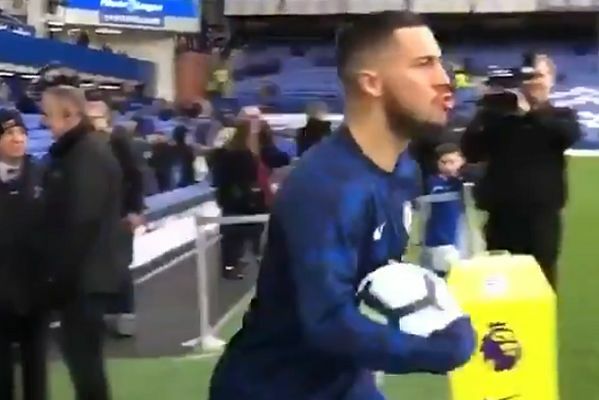 Eden Hazard booed Ross Barkley before Chelsea’s 2-0 defeat at Everton on Sunday, joining in with home fans booing the player who left them for Stamford Bridge. As Maurizio Sarri’s men were making their way onto the pitch, former Toffees midfielder Barkley was given a hostile reception by sections of the Goodison Park faithful. Making light of the situation, Belgian star Hazard audibly joined in with the heckling as he trotted out of the tunnel behind his teammate. Hazard and Barkley were unable to prevent another sub-par away day showing from Chelsea, who now lie 6th in the Premier League table. Despite dominating the early stages of the game, hitting the post through Hazard, they succumbed to second-half goals from Richarlison and Gylfi Sigurðsson.